Hello everyone, today I'm back with my now fortnightly blogging advice segment because you guys haven't told me you hate it or asked me to shut up yet and because you enjoyed my last post on effectively scheduling posts so much I thought I would share a little bit more about my experiences of blogging. Today I'm going to focus a little bit on expanding your community, making friends and forging relationships with fellow bloggers in the form of a mini Q & A, otherwise I could literally go on all day about the blogging community and engaging with your audience! Blogger chats are a way in which bloggers, writers, marketing professionals, and anybody who wants to be part of the community come together for a weekly chat about anything and everything. Often they are centered around a topic of discussion which is open for comment and idea sharing or it is an open chat where you can pose questions, thoughts or comments to the group for comment and discussion. Anybody who is involved or has an interest in the blogging world can join in! If your thing is books you can be sure there will be a book bloggers chat or perhaps you're a big foodie and looking to swap recipes, then the food blogger chat is the ticket for you, whatever your niche there will be a chat for that, I for example take part in the lifestyle and beauty bloggers chats. 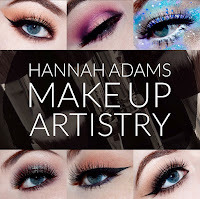 Hashtag, hashtag, hashtag (as you'll have perhaps guessed these chats live on Twitter) whichever chat you choose to take part in will have a designated hashtag for example the lifestyle bloggers hashtag is '#lbloggers' and the beauty bloggers one is '#bbloggers' To search for these chats all you have to do is type the hashtag into your Twitter search bar at the designated time and that's that, you are officially taking part in a blogger chat. Well first of all it is so much fun and in addition to the obvious benefits of being enabled to easily promote your blog and brand it's a great way to meet new people. It is a very rare thing in real life to find people with so much common ground and so much to talk about on a weekly basis and it is a fantastic boost. The blogging community and the weekly chats have helped keep me motivated, inspired and generally upbeat about my writing and life online. 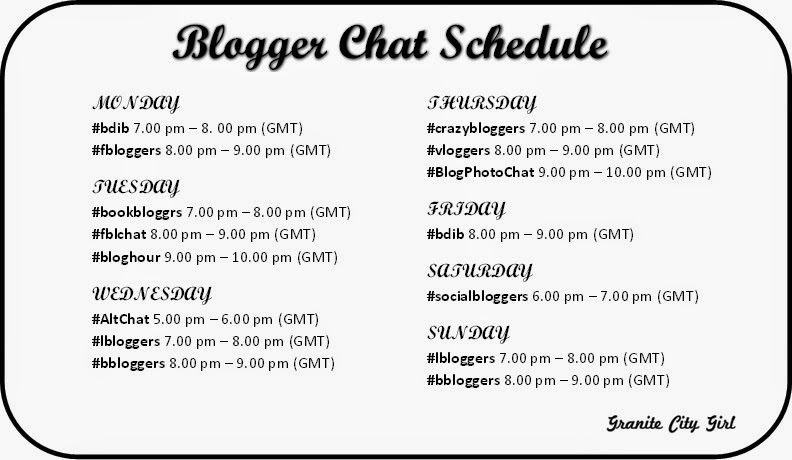 As always I hope this has been able to help at least one of you in some small way (and if it hasn't well it has certainly made me a bit more organised when it comes to blogger chats and obviously given that this timetable will be living on my blog, I really have no excuse for missing one every again. Be sure to leave your questions, comments and feedback below and of course if you are a fellow blogger and have noticed I have missed out one of the key blogger chats or a special nugget of information be sure to share that with me on here, on Twitter or of course if you just enjoyed this post and would like to keep up with the latest Granite City Girl posts you can always come find me on Bloglovin. Until next time folks, I'll be refining my chat etiquette. Such a useful post! I really recommend being part of blogger chats, despite my sporadic attendance. Handy little graphic too! Thank you, I'm glad you find it useful, I can't lie and say I was being totally selfless when I wrote this, it's to keep me disciplined as well as inform everybody else! I know what you mean, I'll often be sitting down watching a movie or eating dinner and see I have already missed them which is a real shame because when I am able to take part they are so much fun!